Recently, I kept seeing a crochet potholder pattern come up in my friends feed on Ravelry being favorited and queued. There are a number of pretty and colorful ones that people have made and since I had some cotton yarn in my stash, I caved and whipped one up in pink and green. The pattern is Scalloped Potholder by Pracilla Hewitt. This is the first one I made and I’ll consider it finished when I make the second one, using up two full skeins of Lily Sugar’n Cream cotton. At least that’s the plan assuming I can get another one out of what’s left. I don’t think it will be a problem, though. I think I’ll use mine more as a hot pad then a potholder, but you can never have too many of either! I thought they’d be a good way to use up some yarn in the stash and make something I can use in the kitchen. 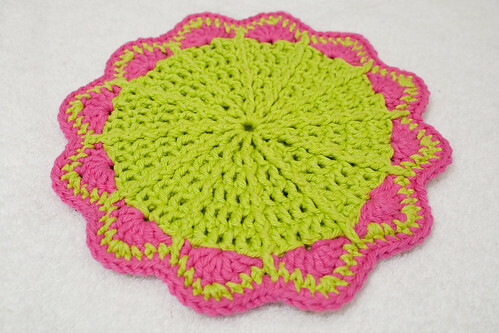 The second one will be opposite: green shells, pink for the rest, and crochet the two together with green. On the second one I might try going up a hook size once I hit the scallops so it will lay flat easier. The one above I blocked because it was curled pretty bad and wouldn’t really lay flat. It seems lays mostly flat now. I think my crocheting was just too tight and pulled it in. We’ll see. I’ll play around with it a bit to see if I can’t get it to lay flat. I seem to have trouble with that sometimes when it comes to crochet! 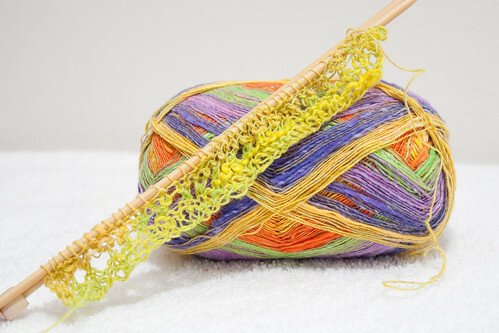 For a few months now I’ve seen Noro lace at various LYS’s. I keep thinking I should pick up a skein, then debate about what I’d do with it and eventually put it back on the shelf. For months, it’s been calling me. Then I saw the perfect pattern: Volna. I had other things going on at the time I posted about it back in November, but recently I picked up a skein at the LYS and cast on last week. I haven’t progressed on it much because I’d been focused on knitting Watershed, then I started the Textured Shawl, but I hope to get back to it once I get one of my other WIPs off the needles. 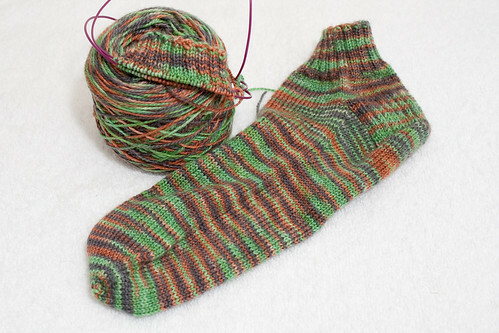 Speaking of which, I did finish one of Matt’s Camo Socks a week or so ago and I started the second one. I love nice the yarn feels knit up. That hot pad/potholder looks super cute & quick – I’ll have to give it a try! Looking forward to seeing how that Noro Lace looks too! Nice work! I love the potholder/hot pad. Volna looks like a gorgeous pattern. It should look great in that Noro lace. Oh I love that potholder and Volna is going to be drop-dead gorgeous!